Guillemot Kayaks has been offering complete plans and instructions for building high performance wooden kayaks since 1993. 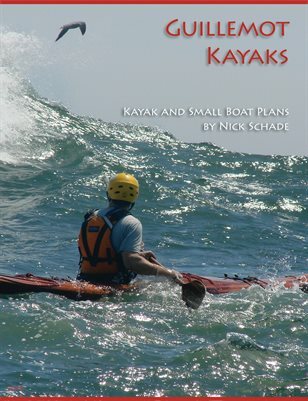 Each kayak plan includes all the forms drawn out at full size and individually. No copying or lofting is required, just glue the plans to your form material and cut out around the lines. Each plan is printed out as an original to minimize any chance of errors being introduced in the reproduction process. Each boat is meticulously designed in a process that typically takes several years of analysis, designing and testing. I am first and foremost interested on how the finished boat handles on the water and concentrate my design efforts towards making the best performing boats you can find. My years of paddling experience comes into play in every boat I design and my years of building boats ensures that the design will be something you can build and enjoy. I have created several "Families" of designs where the different boats in each family bear a similar design aesthetic and related performance profile. For a high level description of these different design families please refer to the links below.